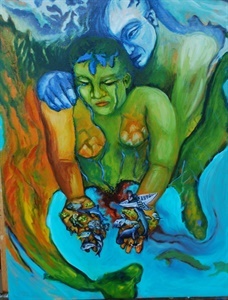 The Gulf of Mexico paintings were inspired by a need to come to terms with the tragedy in the Gulf. 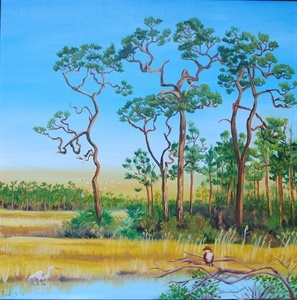 Visiting and painting my favorite places was a way to grieve what has happened and the potential loss of Florida’s coastal habitat and also send loving energy to help heal and protect the beautiful abundance of life there. Many of the paintings were done plein air, some are studio paintings. I continue to create this series of works to love and support our Gulf Coast an raise awareness of its importance. The oil spill and corexit caused the death of great numbers of creatures. I created this piece as a memorial to those who lost their lives and as a blessing to those who survived. 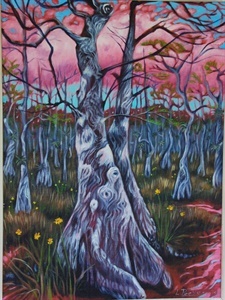 The oldest cypress behind Clyde Butcher's. 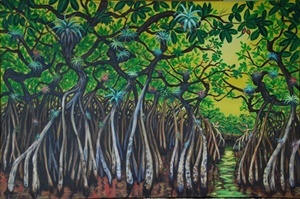 Inspired by a trip down the Turner River in the Everglades. Oil on gallery wrap canvas. Content copyright by Leslie M. Peebles.